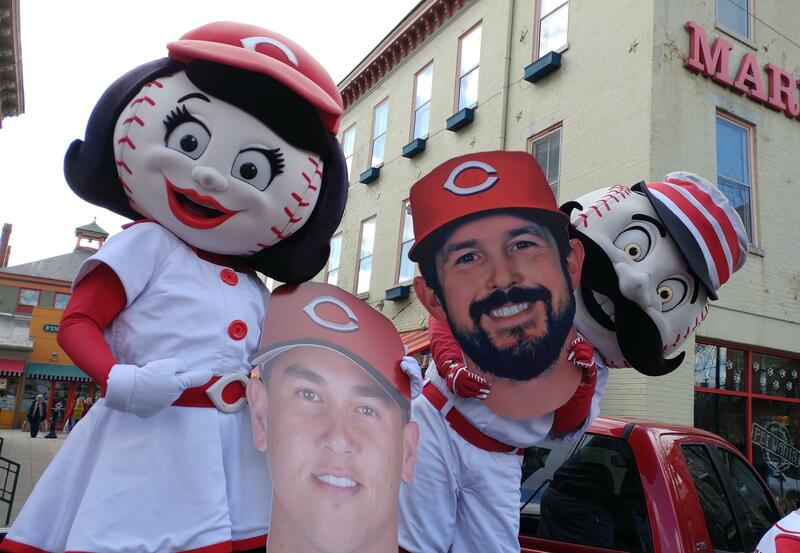 Rosie Red and Mr. Redlegs hold cutouts of Danny Graves (left) and Sam LeCure (right). The 99th Findlay Market parade will not be on Opening Day, and there will be two grand marshals and an honorary grand marshal. 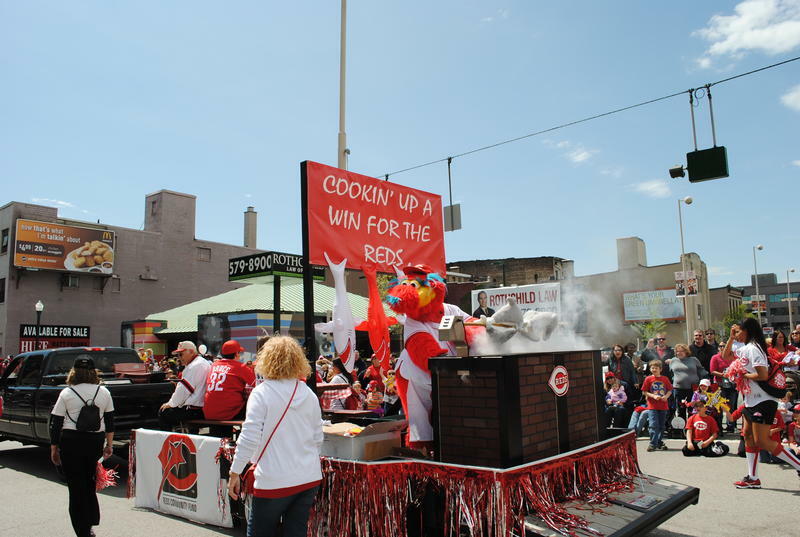 Parade Chairman Neil Luken says the Reds first game is on the Thursday before Easter, March 29, and the parade would interrupt normal business at the market. Instead, the traveling celebration will be held on April 2, the day after Easter, and the day of the fourth Reds game of the 2018 season. That was announced last October. Luken says former Reds pitchers Danny Graves and Sam LeCure will lead the parade, along with the family of Walter "SuperBubz" Herbert, the Cincinnati 6-year-old who died last October from cancer. "Everybody saw when Joey Votto gave this guy the jersey last year when he hit the home run," Luken says. "His family is actually going to be honorary grand marshals and ride in the parade." The parade falls on what would have been Herbert's seventh birthday. "That's what Cincinnati is all about," Luken says. "Believe me, we want championships, we want all that. But those moments steal your heart away." Danny Graves played for the Reds from 1997 to 2005. Sam LeCure was a Reds reliever from 2010 to 2015. Both men will be part of the Reds broadcast team this year. "That's our way of saying 'Hey, welcome back to Cincinnati. We want you guys to enjoy this. We want to show you how proud we are of our city, our heritage and of the Reds,'" Luken says. Luken says the parade itself has been capped at 180 entries. "The problem with the parade is if it goes on for more than two hours, people get bored. You can only see so many cars and clowns and trucks." Luken says he doesn't want to get ahead of himself, but points out 2019 will be the 100th Findlay Market Opening Day Parade, and the 150th anniversary of the Cincinnati Reds. "We have plans in to have a bunch of the previous grand marshals back in the parade. So next year's going to be a different can of worms no matter when it happens. We might have to stage it a week in advance because it'll be so big," he jokes. The parade begins at noon at Findlay Market. The route is south on Race Street, to Fifth Street, then east to Main Street. The Reds play the Cubs that day. The first pitch is scheduled at 4:10 p.m.